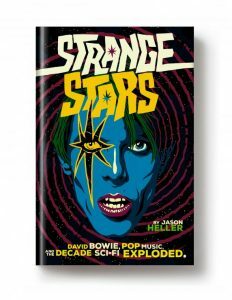 When my book Strange Stars: David Bowie, Pop Music, and the Decade Sci-Fi Exploded was about to come out earlier this year, I had plenty of discussions with Melville House’s staff about how we might promote it. I was adamant about one thing: I had to go on tour. And it couldn’t be a tiny tour. It had to be a big one. Before I was an author, I was a musician. (Okay, technically I still am a musician; in fact, my current band Weathered Statues just released an album, and we’ll be touring Europe this fall.) In all my time as a touring musician, I’ve happily hopped in crappy vans and driven hundreds of miles to play dozens of shows for tens of people. It’s just what I do. When I create something—especially something as dear to my heart as Strange Stars—I feel this uncontrollable urge to hit the road and tell people about it. Melville House obligingly obliged. 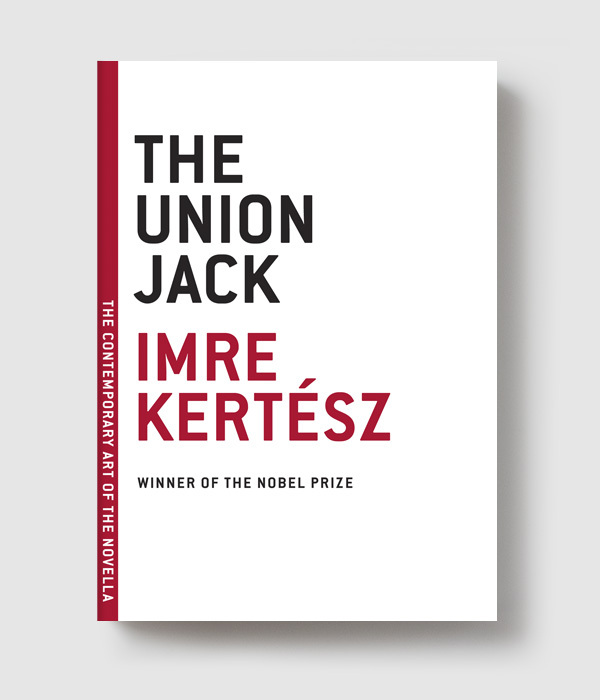 And so, on June 8, I embarked on a three-week book tour of the United States. Here’s a diary of those three weeks, a whirlwind trip that was only the first leg of my Strange Stars tour. I’ll be heading out soon to continue my trek… and hopefully see you in your hometown to discuss David Bowie, science fiction, and how the music of the ’70s was a treasure trove of cosmic and technological delight. 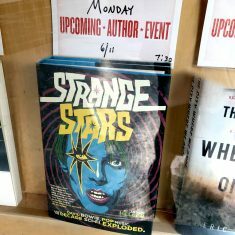 Three days after Strange Stars was published, my tour kicked off at my hometown bookstore, Tattered Cover in Denver. 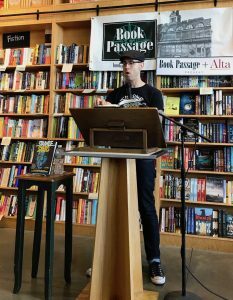 It was heartwarming to see a lot of friendly faces in the audience, plus co-owner Len Vlahos—an author himself—came out to introduce me. I embarrassed my mom by calling her out from the lectern and explaining why I dedicated Strange Stars to her; she instilled a deep love of music in me when I was a kid, and she bought me a ticket to my very first concert, which aptly enough was David Bowie in 1987. Overall, I couldn’t have asked for a better sendoff. Spotted in Portland. Photo by Sam Rosenthal. Another Pacific Northwest city… another TV interview! In Seattle, I show up bright and early at KING to appear on their New Day Northwest program. The interview is a blast, and after it’s done I kill some time before meeting up with my friend and fellow author Jesse Bullington, writer of many fine historical horror and epic fantasy novels (some under his name, others under his pen name Alex Marshall). He and his partner Shandra drive me to Third Place Books’ sumptuous location in Ravenna. There I unexpectedly find another author friend of mine, Rhiannon Held, in the audience! 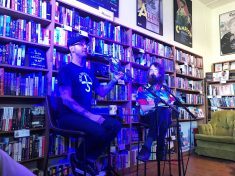 The reading is lively, the discussion about sci-fi music even livelier, and I start to feel like I’m hitting the rhythm of being on a book tour. At Book Passage. Photo by April Whitney. The minute I walk into Mysterious Galaxy, I feel like I’ve entered Narnia. Not because the store has an abundance of C.S. Lewis books, but because it’s a magical place full of just about everything I could ever imagine wanting to own, from Shirley Jackson t-shirts to an amazing selection of current science fiction and fantasy novels. (I immediately spy Sam J. Miller’s new novel Blackfish City on full display, and it’s one of my favorite books so far this year.) 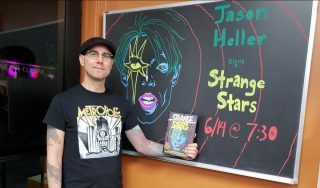 And one of the employees has painstakingly replicated the cover image of Davie Bowie from Strange Stars—originally illustrated by the great Butcher Billy—on the store’s dry erase board. When I die, please bury me in Mysterious Galaxy. Future shoppers: Sorry about the smell. David Bowie tattoos. I get shown more than one of them after the event at Book Soup in Hollywood. This is the biggest and most enthusiastic audience I’ve had so far on tour, and people passionately share their memories of Bowie during the post-reading discussion. Of course, Strange Stars is about much more than Bowie; it’s also about Parliament-Funkadelic and Kraftwerk and Rush and Devo and so many other musicians of the ’70s who drew from science fiction. But Bowie is definitely the main draw, and it feels great to be in a room surrounded by so many fellow travelers through Bowie’s many musical worlds. Plus, no fewer than four old friends of mine, who previously lived in Denver but now call LA home, showed up: thanks Brian, Jason, Jeff, and Suzanne! As amazing as my first full week of book touring was, it was so nice to see some familiar faces. Backlit in Brooklyn. Photo by Joshua Bilmes. I have a couple days off! Which is good, because one of those days is entirely consumed by traveling from LA to New York. The flight is pretty smooth, though, and I land at JFK in good spirits and ready to tackle NYC. Not only am I going to be doing a reading at McNally Jackson’s brand-new location in Williamsburg, I’m going to me meeting my agent (Eddie Schneider of JABberwocky) and my editor (Ryan Harrington of Melville House) for the first time! At Melville House’s offices in Brooklyn, I finally get to shake Ryan’s hand and thank him for championing and shepherding Strange Stars through plenty of ups and downs (but mostly ups) over the past two years. I also get to meet the whole Melville House crew, including my incredibly talented (and tolerant) publicist Stephanie DeLuca, and publishers Valerie Merians and Dennis Johnson. I finally get to put faces, voices, and handshakes behind all the emails, and I feel so lucky to be part of such an amazing team. Naturally, I pitch my next book idea to everyone while we’re meeting — and while I don’t want to jinx anything, I think I piqued some interest. Afterward, I grab coffee with Eddie and my friend Reggie, who used to DJ with me in Denver before he moved back to his native New Jersey. Soon we’re joined by two more awesome author friends of mine, Livia Llewellyn and Robert Levy (read them, they’re both so good). This party train pulls into McNally Jackson for tonight’s reading, where I see a few more familiar faces—hey Chad, Patty, and Jeremy!—before I start the reading. In the middle of reciting a passage from the book, a fruit fly flits into my mouth and I swallow it. Not the best thing to happen while you’re in the middle of the reading. But I grimace, gulp it down, take a slug of water, make a joke about getting a free meal, and keep going. From there, a few of us head to a local watering hole for drinks (I’m sober, so it’s soda water for me) before I drift back to my hotel room amid a light drizzle. Pretty magical day, all in all. 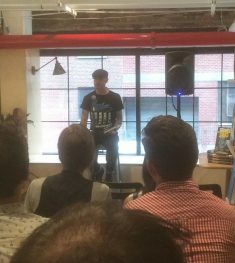 Publishing is a small world — as evidenced by the fact that I’m appearing at Greedy Reads, a new bookstore in Baltimore, tonight. 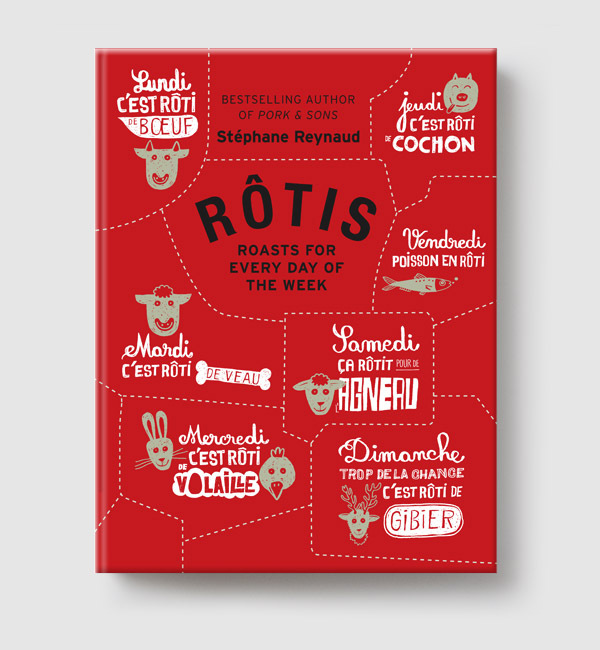 The gem of a shop is owned by Julia Fleischaker, who previously had been the head of publicity at my publisher, Melville House. Greedy Reads is everything I love about independent bookstores: homey, quirky, and incredibly well curated, with a lived-in atmosphere that belies the shop’s newness. One of my favorite current writers of science fiction and fantasy, Sarah Pinsker, takes me out for some incredible sandwiches at Ekiben before the reading; Sarah and I hit it off a couple years ago after realizing we were both speculative fiction authors who also played and recorded music. It all adds up to one of the best stops of the tour, no doubt. Dave Weigel and I at Politics and Prose. Photo by Mark Masters. Dave Weigel is best known for his political journalism for the Washington Post as well as his time on MSNBC as a pundit. But he’s also a big ol’ music nerd, too, as evidenced by his recent book The Show That Never Ends, a history of progressive rock. 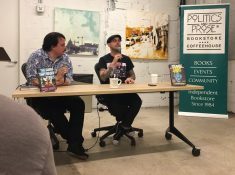 I cited Dave’s book in Strange Stars, and he’s been kind of enough to tweet some favorable things about my book, so perhaps it was kismet that he and I wound up sharing an event in D.C. and the new Union Market location of Politics and Prose. 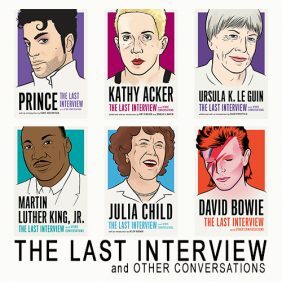 Rather than read from our respective books, Dave and I had a conversation about the wonder and weirdness of ’70s rock. It was great getting to meet him, and what do you know, I also got to meet a couple more writerly acquaintances in the flesh for the first time: Craig L. Gidney (who I knew from the speculative fiction world) and Marc Masters (who I know from the music criticism world). Once again I’m blown away by the excitement and support shown by the booksellers at these events. Thank you, all. At Book People! Photo by Steven Berger. After D.C. I fly back home to Denver. There I rejuvenate myself for a couple days (lots of sleep and catching up with my wife, plus a DJ gig) before I leave on the next leg of this journey: a quick road trip down to Texas and up through Kansas and Nebraska. My first stop is Austin, another city I love but haven’t been to in ages. It’s even better than I remember. 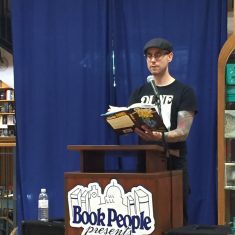 Book People is one of the most renowned bookstores in the country, and for good reason: It’s a dream for book lovers, and the staff is rolling out the red carpet for me. The audience is large and the reading goes smoothly — that is, until one person in attendance feels the need to say that people who got into David Bowie because of his ’80s fantasy movie Labyrinth aren’t true Bowie fans. I thought I was going to have a bookstore brawl on my hands. But I managed to cool down the situation (okay, so no one really got that upset) and keep the peace in this Texas town. So I had to get lost at least once on this road trip, right? Following an unintended detour way down in the southern suburbs of Dallas, I finally correct my course and make my way to the north part of town, where resides Interabang Books. It’s a relatively new store, and it’s lovely. Open and airy rather than mazelike, it’s a fresh take on the traditional brick-and-mortar bookshop floorplan (apologies for geeking out, but I worked retail for over a decade, including a stint as the manager of a comic book store). Dallas is unknown territory to me, and I didn’t know a single person in town — but that didn’t matter, as Texan hospitality proved once again that it’s no exaggeration. I even got a glowing profile in the Dallas Morning News courtesy of local journalist Chris Vognar. Having written hundreds of profiles on authors and musicians over the years as an arts-and-entertainment journalist, it’s kind of awesome to be on the receiving end. Kinda blue in Lawrence. Photo by Abby Hoffman. I arrive in downtown Lawrence in the early afternoon and check into the venerable (and reputedly haunted) Eldridge Hotel. After unpacking my bags I open the curtains of my room and am immediately struck by… the sign of the Raven Bookstore, which is coincidentally across the street. Full disclosure: It was no coincidence. The Eldridge was recommended to my by Jeremiah Tolbert, a friend of mine as well as an acclaimed author of weird fiction who calls Lawrence home. He’s in attendance that night at the Raven, of course, and I appear in conversation with local musician (and Raven employee) CS Luxem, who leads our chat with a deep and obvious love of cosmic music. And DJ Fella Cutie (I’m assuming that’s an awesome twist on Fela Kuti) brings turntables and supplies some stellar space music to the whole affair. To top it all off, I have the best pancakes of my entire life the next morning at a wonderful place called the Ladybird Diner. I kid you not. I don’t joke about pancakes. Fortified with flapjacks, I make the three-hour drive from Lawrence to Lincoln. People like to make fun of Kansas and Nebraska as flat, boring places to drive through. I’ve never found that to be true, and this drive is downright bucolic. Come to think of it, people also like to stereotype the middle of the country as a place where reading is dead, culture doesn’t exist, and touring authors would be wasting their time. I’m a little touchy about that stereotype, because I live in a flyover city myself. Plus, that assumption is patently untrue; so far, all my events in the middle of the country have been, on average, better attended than my events on the coasts. Jason Heller has written for publications including the New Yorker, Rolling Stone, Pitchfork, and The AV Club. His books include Taft 2012, Slappy’s Revenge, and, most recently, Strange Stars: David Bowie, Pop Music, and the Decade Sci-Fi Exploded, out now from Melville House.